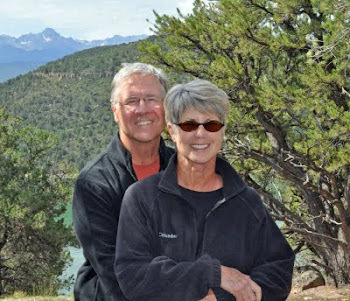 Find us on Google+ Rick and JoAnne's RV Travels: Oct 1-2, 2010 Surprises…all the way around! Friday - On our way to our next adventure we had our 1st surprise – TWO, yes, TWO flat tires. What a nightmare! After 3 ½ hours in Dumas, TX getting them replaced…Ahhhhhhhhh…we were finally on our way again! Arriving here at 7:00PM, and waiting in the long check-in line, we met Vicki & Ron. Not having reservations, (our usual procedure), we asked them where we should stay. The Mesquite Campground is the best! It’s the most secluded, and you are down in the canyon, plus you are not parked on top of one another, but if it rains, you maybe have to stay a while longer since the roads flood – perfect we said! Surprise #2 – who knew there was this absolutely 20K acre, 60 mile long, 800 ft decline into the stunning “Grand Canyon of Texas” – filled with colorful history. Saturday - Much of today was spent recuperating from Friday, organizing, and touring the town of Canyon. Remember when we mentioned we went 25 miles on a dirt road? Part of our “excursion” today was to find a car wash…success! On our return to camp, we toured beautiful Palo Duro Canyon and the Park. What scenery, history, and Texas Longhorn’s to boot. You guys live the life!!! Well except for the flat tires. Sorry to hear that.